Successfully Added PTZ Dome Outdoor IP Camera "Arch Dome II" - 960p, 4x Optical Zoom, 60m Night Vision, Plug And Play to your Shopping Cart. If your looking to step up your home security you cant go wrong with the brand new “Arch Dome II” PTZ IP Camera. Recording in 960p quality at a frame rate of 25FPS, not a single detail will escape this extremely advanced camera. To get a more detailed view, you will be able to zoom in up to 4 times using the 4x optical zoom. Even better, installation couldn’t be easier as this IP speed dome camera automatically configures itself. Once installation has been completed, you will be able to access the live stream of the camera by simply logging in from anywhere using your Android or iOS smartphones. That way you always have a view of what's going on when you need it. Also you can connect via your computer so there is no excuse to not see what is happening. This full metal IP camera is constructed to survive in the harshest environments and can be used both indoor and outdoor as it is waterproof. Rotating 355 degree around its axis and 90 degree up and down, the “Arch Dome II” has an extremely wide field of view and will be able to catch the movement of intruders thanks to its motion detection feature. 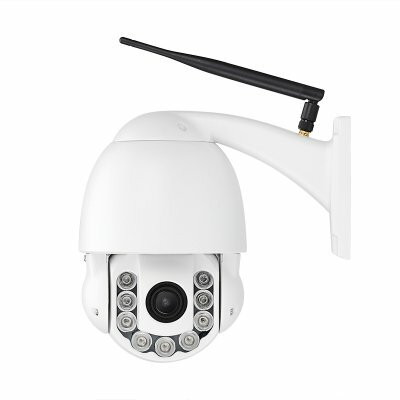 This Plug and Play PTZ Dome Outdoor IP Camera "Arch Dome II" comes with a 12 months warranty, brought to you by the leader in electronic devices as well as wholesale IP cameras..